Navroze Mubarak! Wishing all my Parsi friends, family, and everyone celebrating Navroze around the world a very Happy New Year. 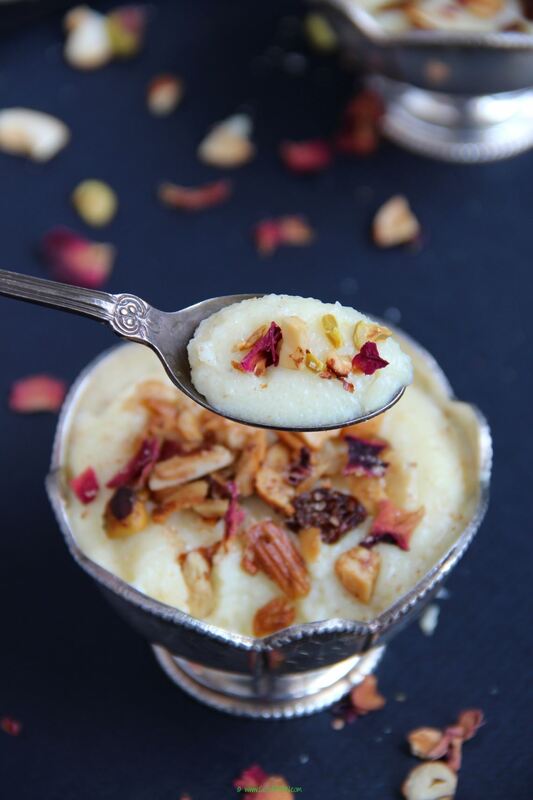 Navroze isn’t compete without Ravo – A delicious creamy semolina pudding flavored with rose water and nutmeg. This recipe is my great grandmother’s and has been passed down a couple generations. The semolina or rava is slowly roasted in ghee. Then sugar, milk and eggs are added slowly and cooked into a thick creamy pudding. Once cooked, it with flavored with rose water and nutmeg. 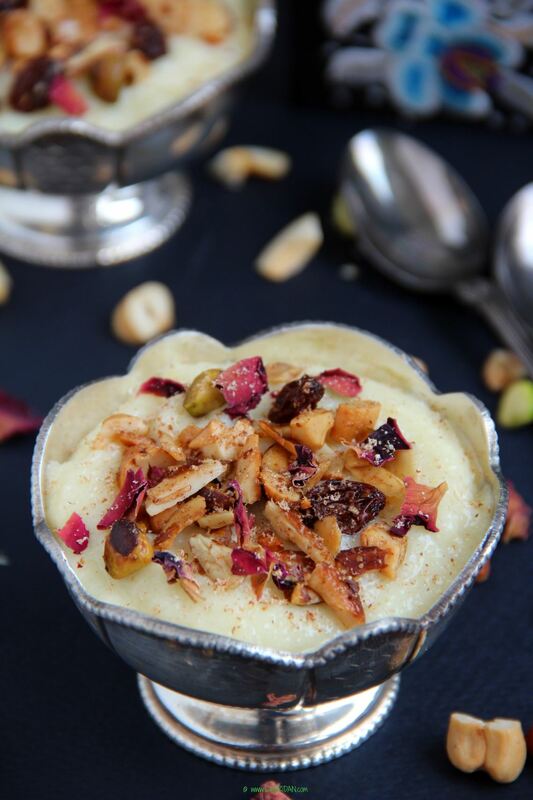 It is served topped with almonds, cashews, pistachios and raisins that have been fried in ghee. Every mouthful is a delicious blend of flavor and texture. Here are a few things you want to keep in mind while making the ravo…brown the semolina on a very low flame so that it cooks but does not burn and do not be tempted to reduce the amount of ghee; it just does not taste the same with less ghee. Also be sure to drizzle in the milk and egg mixture very slowly stirring vigorously so that the eggs temper and do not curdle. I prefer to use a whisk the entire time to stir as it prevents lumps from forming. • In a bowl whisk the eggs well. Then add milk and whisk again. Set aside. • In a heavy bottom pan heat the ghee. Add semolina and cook for about 5-7 minutes on low heat till the semolina is cooked. Do not let it brown. • Take the pan off the heat and very slowly drizzle in the egg and milk mixture stirring continuously with a whisk. Do not stop beating or the eggs will curdle. • Continue to whisk and add in the sugar. Return the pot to the heat and cook on medium for 8 minutes until the sooji has absorbed the milk and thickened. • Take it off the heat and add rose water and nutmeg and whisk well. • As the ravo cools keep beating it every few minutes to prevent a skin from forming. 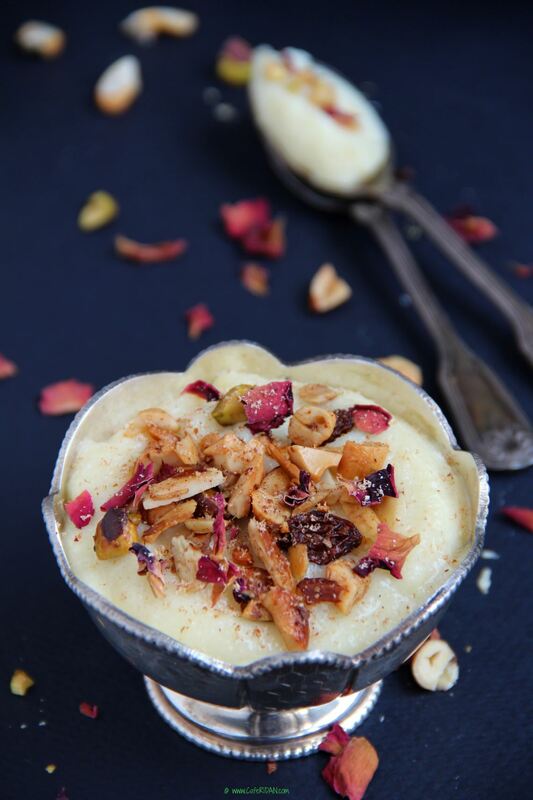 • Once the ravo has cooled, sprinkle the fried nuts generously to cover the top of the bowl. Sprinkle a little more nutmeg and rose petals. • Serve warm, cold or at room temperature. • Heat a tablespoon of ghee in a small pan. • Fry the mixed nuts until lightly brown. Drain on a paper towel and set aside. Ravo thickens as it cools. If it is a too thick you can always add a little warm milk and whisk well to thin it out.